Wrinkles are usually due to faulty installation of the carpet. Our technicians use a power stretcher, ensuring that your carpet is stretched adequately. Even with humidity and temperature changes, your carpet will not become loose enough to cause wrinkles. Pricing can vary on carpet repair work depending on factors such as yarn style (berber, frieze, plush, etc. ), size of repair, available remnant pieces, etc. Therefore, we are not able to give exact pricing online, but we can give you an over-the-phone estimate, an in-home estimate, or estimate via email . Often times, customers will ask if furniture is an issue when stretching the carpet. This can depend on various factors such as concrete or wood subfloor, how heavy the furniture is, and the layout of the room. Usually, furniture is not something to be concerned about, so we do not charge extra for moving furniture. If the room has wood subfloor, we only need about 4 feet from the wall we are stretching to. This means that we can slide the furniture out 4 feet to stretch, and then place it back when we are done stretching. Unless the furniture weighs several hundred pounds, the power stretcher will actually move the furniture with the carpet as it is being stretched. For furniture to not be an issue we please ask that if there are any valuables, electronics, lamps, etc. that you move them to a safe location. The above before and after picture shows our technicians work with stretching a homeowners carpet. Our technicians are trained to make sure that wrinkles are stretched out correctly. We are confident enough in our stretching methods that we will provide a 5 year guarantee in writing. 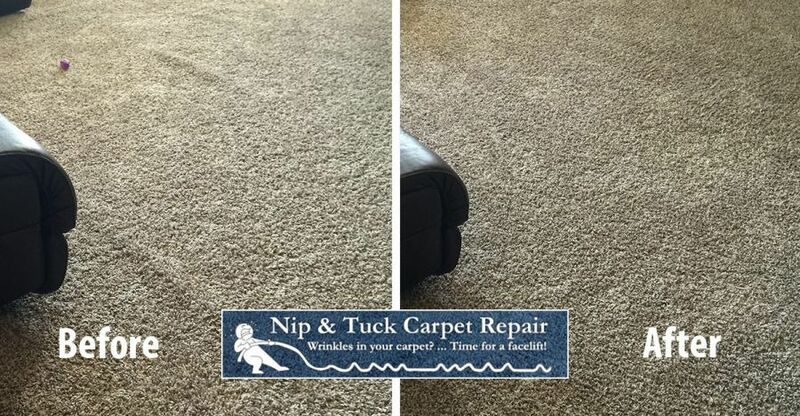 So give us a call for a free estimate today to help make your carpet looking great again! Pricing can vary on carpet repair work depending on factors such as yarn style (berber, frieze, plush, etc. ), size of repair, available remnant pieces, etc. Therefore, we are not able to give exact pricing online, but we can give you an over-the-phone estimate, an in-home estimate, or estimate via email.